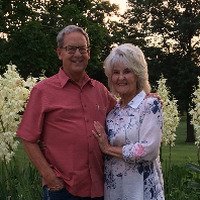 Retired commercial construction manager; wife is retired human resources (HR) consultant. Long-term residents of beautiful southwestern Colorado, where we have a unique passive & active adobe solar home and recreational mountain property. Now 'on the road' living more of the good life. Have good (well, at one time, anyway) mechanical and carpentry skills, problem solving ability. Will pitch in if you need a hand on a project. Deserts, mountains, lakes, seashore, farming country. 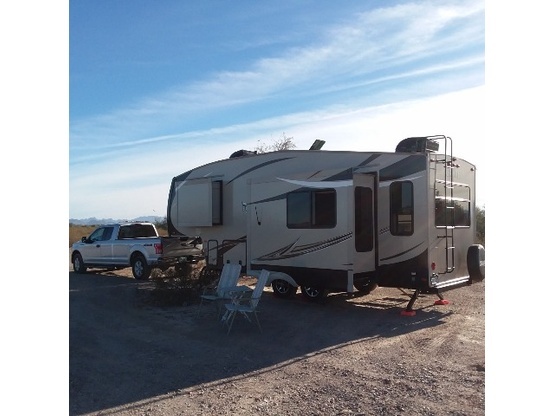 We drycamp while traveling, as well as boondock. @ BLM LTVA La Posa North, Quartzsite, Jan, 2017. 2017 F-150 longbed twin turbo v6 with heavy duty payload package and max tow package, easily pulling 2016 Sabre Lite 30ft. 5th wheel. We enjoyed the time shared with this wonderful couple during their stay on our driveway while in our little town of Sanford. They are both very kind souls with an easy-going nature. We were amazed by the amount of time they have been on the road and inspired by the many places they have enjoyed visiting. They are definitely a couple on the move with a zeal for the travel life and in getting to know people. Robert has an in-depth knowledge about all-things RV and I picked up valuable insight into our future RV purchase. They are more than welcome to come back and stay another spell on our driveway! The best part of Hosting Boondocker's is making friends of our guest travelers! It's such a pleasure to meet such wonderful new friends and hosting our friends from Durango was an honor. We enjoyed their company as we shared a glass of wine and stories, so much fun to enjoy the Jazz Festival with them, a great evening. We are hoping they stop back soon and keep in touch as we travel. We spent a delightful evening with the DurangatangRLs swapping road adventure stories. They are welcome back anytime. We would love to see them again. They were only passing through so we didn’t get a chance to continue our conversation the next day. They were extremely polite and were thoughtful. Seriously, having Boondockers Guests at our place is almost as good as being on the road. Thanks for stopping by. Hoping that our paths cross again in the future. Thanks for spending time with the horses. Would love for you to come back so we can meet. Thanks for the note. Mark fixed the fence for us. A very nice couple, who's visit was much too short. At least they had a few minutes to experience out little town and chat with a few locals. Hope to meet them again, maybe in AZ, if their plans change. This couple is just starting the 2nd year of their 2 year long travel adventure. We enjoyed their stay with us and sharing similar adventures & interests. They are absorbing the sights and sounds they find around them and are really comfortable to be with. You will not have any better guests than these two. They requested a three night stay and we were glad they did. Wonderful, interesting folks and great guests. Shared some wine on our back deck each evening. They were sightseeing in the area but took their last day to to just sit still and relax. We love that they used our place as a base from which to explore, but also that they were comfortable using it for some downtime. I have one request when you stay at our place that is you leave it better than you found it. Robert and His beautiful wife did just that.. No only did they enrich our property but also our lives. Thanks again for your quit gentle spirit it was a very special gift to our land and our lives. We enjoyed meeting them, they are pleasant and welcome if they come this way again. Quiet courteous couple living their lives on the road, best of luck.